Orono, Maine — The No. 7 seeded University of Maine football team (9-3) jumped out to an early 21-0 lead in Saturday’s NCAA Football Championship Subdivision (FCS) Second Round contest and never looked back, defeating No. 8/9 Jacksonville State, 55-27 at Alfond Stadium. The victory marked Maine’s first-ever home playoff victory and will advance the Black Bears to the FCS Quarterfinals for the fourth time and first since 2011. The Black Bears, whose calling card is their “Black Hole” defense, instead jumped out to a huge lead thanks to the play of their offense. Chris Ferguson threw for five touchdowns and Ramon Jefferson added a career-best 186-yards on the ground and two scores as the Black Bears racked up 427 total yards on the afternoon. Ferguson’s five touchdowns marked a new single-game playoff high for the Black Bears while Jefferson’s rush yardage was Maine’s second-highest playoff total. Maine’s 55 points were its highest playoff point total in eight postseason appearances. 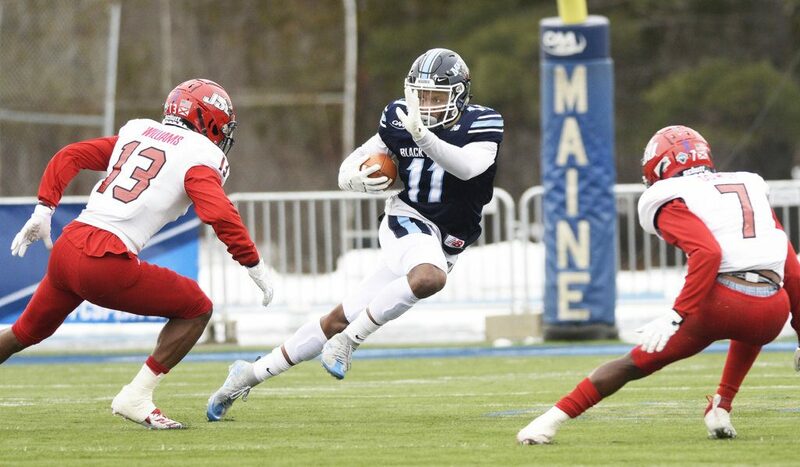 Earnest Edwards found the end zone on three occasions; twice through the air and once on the ground Jaquan Blair, Micah Wright and Drew Belcher rounded out Maine’s touchdown receptions. Wright, who finished the game with three receptions, moved into fifth in Maine’s record book with 163 career receptions. As a whole, the offense was extremely efficient inside the 20, posting a perfect 6-for-6 showing in the red zone. The Black Bears rushed for 268-yards, averaging 6.0 yards per carry to match a single-game school playoff high. Maine’s hot scoring start was setup by an early JSU turnover. On the Gamecocks’ first drive, Whitaker forced a strip sack and Maine would recover on the JSU 4. On the next play, Ferguson lofted a pass to Blair for the first score of the afternoon. The touchdown began a streak which saw Maine score on three consecutive drives. Jacksonville State was able to get on the board with 1:12 left in the period when Zerrick Cooper found Jamari Hester for a 36-yard touchdown, and the Gamecocks clawed back to make it a one score game when Cooper’s first down pass found Hester who managed to get outside, sprint 70-yards down field for his second score of the game. But the Black Bears responded with 21-unanswered points to end the half to pu the game out of reach. Maine moves on to play the No. 2 seed Weber State in Ogden, Utah on Friday, Dec. 7 at 8:00 p.m. ET It will be broadcast nationally on ESPN2.